Chimamanda Adichie's Purple Hibiscus as a Bildungsroman/Narrative of Growth. A bildungsroman is a novel that looks at the growth and development of the main character or protagonist from childhood innocence to adulthood. It is a novel of formation, novel of education or coming-of–age story (though it may also be known as a subset of the coming-of-age story). Bildungsroman can also be defined as a literary genre that focuses on the psychological and moral growth of the protagonist from youth to adulthood (coming-of-age) and wherein character change therefore is extremely important. Therefore, this work shall examine growth and development as a recurring idea in Adichie’s Purple Hibiscus. In other words, this work examines Adichie's Purple Hibiscus as a narrative of growth or a coming of age story or Bildungsroman (as it is been called the Germans). The work also examines how growth and development function as a literary vehicle by means of which new contemporary Nigerian identities are produced in third generation novels. Characteristics of a Narrative of Growth/Bildungroman. The protagonist may be an orphan. As the character develops, the character discovers his or her inadequacies. The character begins to display resentment for his or her condition. The character leaves the countryside to the metropolis. The character returns to the primordial base –there he or she measures his or her development against the primordial base. 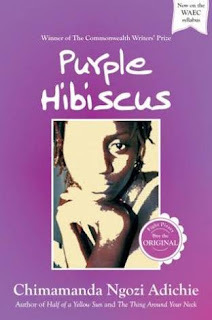 Adichie's Purple Hibiscus as a Narrative of Growth/Bildungsroman. Adichie uses the growing character technique to exhibit the trauma present in African society. In this novel, we will see the developmental process of the protagonist, Kambili, who is also the narrator from the beginning of the narrative to the end. In other words, we shall examine growth and development of the protagonist as a recurring idea in this narrative. Although the narrative begins from near the end, we will see in the beginning that Kambili is immature and young because she is a shy girl. She is also shown as naïve and innocent which makes us feel for her. Kambili is obsessed with her father; she thinks he is always right and because of that obeys and pleases him. This is shown when Father Benedict commends her father for his donations and contributions in church; Kambili says: “And I would sit with my kneels pressed together, next to Jaja, trying hard to keep my face blank to keep the pride from showing because papa said modesty was very important.”(p.13). Kambili is so naïve that even when the father causes her pain, she sees it as love. This is evidenced in statement about the love sip from her father’s teacup: “The tea was always too hot, burned my tongue, and if lunch was something peppery, my raw tongue suffered. But it didn’t matter because I knew that when the tea burned my tongue, it burned papa’s love into me.”(p.16). Even if it hurts her, Kambili drinks the tea to please her father and stays within his love. Kambili is considered a ‘backyard snob’ by her classmates because she never talks to anyone; never has a friend. In Chimamanda Ngozi Adichie’s Purple Hibiscus, you will see the motif of growth and development throughout the novel. With regards to this, this novel is called a narrative of growth or what the Germans call the Bildungsroman. Throughout the novel, the protagonist keeps on developing from a very shy, naive person to an outspoken woman. Kambili obeys her father without questioning his absolute rules. Let's take papa Nnukwu’s case as an example. Kambili sees papa Nnukwu as a heathen because her father tells her so. Kambili and her brother, Jaja, are asked by their father not to visit or associate with papa Nnukwu without his consent, and she obeys him wholeheartedly without asking why. She neither listens to music nor watches television. Kambili comes of age because of her experience in Aunty Ifeoma’s house. Initially at Aunty Ifeoma’s house, we discover that Kambili, as a young girl, does not know how to do many kitchen chores such as peeling of yam, cutting of the orah leaves etc. However, later on, through the help of her cousin, Amaka, she learns to do them. (p.268). Through Amaka and Aunty Ifeoma, Kambili comes of age. She takes a major step towards claiming her individuality. From a quiet girl, she becomes an outspoken girl. She no longer keeps quiet or allows someone to speak for her, and she no longer stutters before saying anything. This is shown when she responds to Amaka’s reaction to her simply because she tells Aunty Ifeoma that she does not know how to cut orah leaves. Kambili says: “I don’t know where these calm words had come from.”(p.177). She is surprised that she speaks back at Amaka without having bubbles in her throat as usual. Again, Kambili questions her father’s rule after witnessing papa Nnukwu’s innocent ritual at Aunty Ifeoma’s house as she says, “I was surprised that he prayed for Papa with the same earnestness that he prayed for himself and Aunty Ifeoma.”(p.175). Papa Nnukwu’s innocent ritual makes her disobey her father for the first time by keeping the painting of Papa Nnukwu, a heathen, as opposed to her father’s rule. She no longer sees Papa Nnukwu the same way her father sees him since she witnessed his innocent ritual. Kambili expresses her emotion to Father Amadi by telling him that she loves him. This shows that she is no longer shy. She now listens to music especially the Fela tape (p.301) and even takes her mother to the prison to visit Jaja. All these show that Kambili has come of age and is no longer subjected to her father’s oppressive act. Indeed, Adichie's Purple Hibiscus is a good example of a Bildungsroman/narrative of growth. What i do not understood is actually how you're not actually much more smartly-favored than you may be right now.